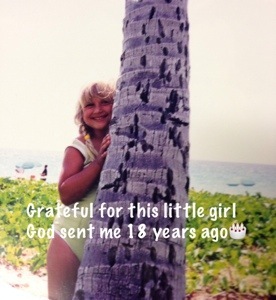 My Baby Turned 18 -How Did That Happen? I had only a few classes this week so no pretty pictures or artwork. But I did hit a BIG milestone this week my oldest daughter Hailey turned 18. Yikes that flew by. I was so caught up with not hearing from CalPoly SLO and Hailey’s basketball CCS playoffs that I did not take stock in the moment. Don’t get me wrong we celebrated and opened gifts but just now it hit me that she is an adult. She can make her own choices and decisions without me. So I figure I have about 3 more months or so of her senior year to enjoy with her. Then it’s summer and off to college. I was really grumpy this week about her not hearing from CPSLO but we knew with less than 50 spots in the program that she probably would not have great odds. But the thing that I’m most grumpy about is that I was not being thankful for all that we have as a family. Hailey has great choices for college, we have an awesome supportive bunch of family and friends-and the really important thing God has a plan and path for all of us :). Just need to remember that when my left eye starts twitching for a solid week. Hope you all take stock in the moments they go by so fast.